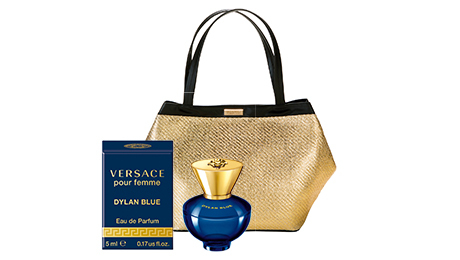 Versace Pour Femme Dylan Blue is an alchemy of irresistible notes. A strong, sensuous fragrance for women who know their own power. Refreshing blackcurrant sorbet and green apple create an unusual fruity accord at the top that combines with clover, forget-me-not and shisolia to produce a unique opening. The heart is a contemporary floral bouquet of rose, petalia, rosyfolia and jasmine that blends with an icy infusion of peach before giving way to a warm, woody dry down of styrax, white woods, musk and patchouli that rounds out this captivating Eau de Parfum.